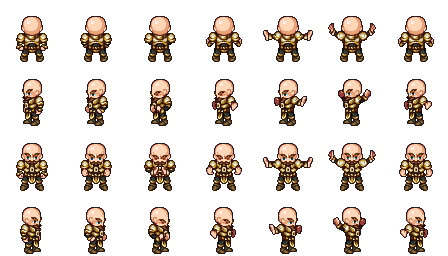 Baldric, a fully animated warrior/general. A 'Suzerain' mage, fully animated but for slashing animations. This design was originally made for Bart's Orange engine and RPG game project (see http://opengameart.org/forumtopic/content-ideas-for-orange). Attribution to Stephen "Redshrike" Challener and a link to www.OpenGameArt.org For Sinbad, attribution to Zi Ye for the design. I feel that many people will fall in love with them. Nice work there, will you be animating other characters in the duration of programming phase? We can use Sin-bad as enemy. How much work would it be to turn the assets used to make these characters into individual items that can be applied to the base LPC models? If you still have this work in a PSD somewhere and it's already partly done I might be interested in working something out to have you finish this set as a collection of armor and accessories. 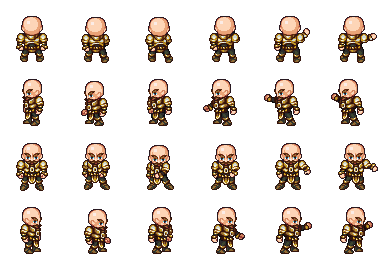 I'm also wondering how much work it would be to make Sin-bad into an LPC compatible character sheet so he could be a playable character. 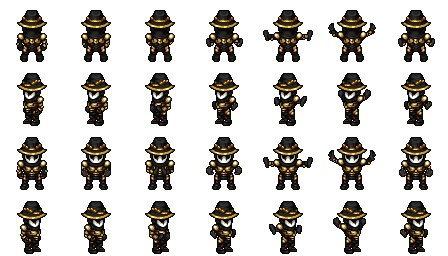 We used the mage as our main character in our free android game, Muulore's Quest, done in 15 hours by 2 programmers! I too would be interested in seeing the other characters animated. Why are there 3 Licences? @call me: You may use them with any of those licenses. Since they are incompatible, author's explicit permission for multiple licenses are required. As cemkalyoncu said, it's to maximize compatibility across different projects. Normally I don't bother with CC-By-SA or the GPL licenses, but in the case of the LPC assets many of the other assets are exclusively SA/GPL so it is necessary. Just choose whichever license best suits your project.